Home » Article » Cindy Keefer » CVM » Visual Music Article » Visual Music Research » 'Raumlichtmusik' - Early 20th Century Abstract Cinema Immersive Environments. 'Raumlichtmusik' - Early 20th Century Abstract Cinema Immersive Environments. "'Raumlichtmusik' - Early 20th Century Abstract Cinema Immersive Environments." "Leonardo Electronic Almanac, Creative Data Special Issue. Leonardo: The International Society for the Arts, Sciences, and Technology, and MIT Press. October 2009." This is an important historical visual music essay on Oskar Fischinger and Jordan Belson's early experiments in creating abstract cinema for immersive projection environments. It traces the origins in their work of what is more common today - the immersive multimedia environment. 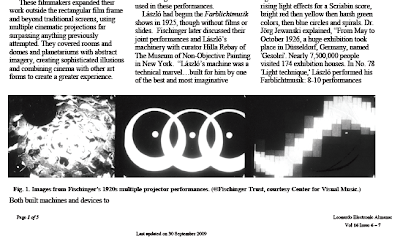 Information about plans Fischinger had to present a multimedia performance for the Farblichtmusik shows (started by L�szl�) has been researched and documented in this essay and is very exciting information to check out for the scholar interested in accurately tracing the origins of visual music and in particular, its links to contemporary multimedia performance. The vortex concerts, are discussed in detail. These concerts are important to check out for both historical visual music but also in relation to tracing the origins of using projected visuals alongside electronic music, which is so common today, in relation to video projection with electroacoustic music. This article traces these connections and provides an introduction to its history. Do go and read. �no separation of audience and stage or screen; the entire domed area becomes a living theater of sound and light." Visit CVM Library Page for more resources in relation to visual music.